This sustainably built home addition, lovingly called the Red Box, gives its residents new, sweeping views of Los Angeles including a direct line of sight to the famous Griffith Observatory. Designed by Jeremy Levine, the project utilizes passive and active sustainable features throughout, while flooding the interior spaces with an ample dose of daylight and cutting back on overall electricity consumption. In addition, the mobile sunscreens on the box’s façade control the amount of light and heat gain within the house while allowing for extra privacy as needed. 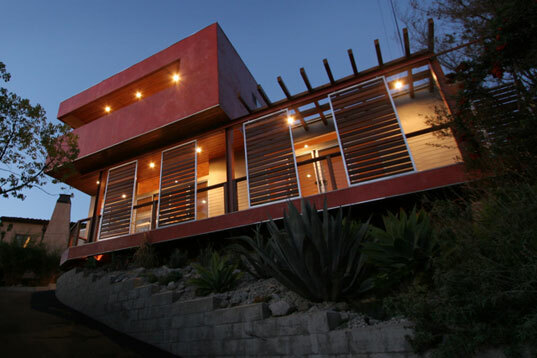 The second-story Red Box is balanced on a steel frame, cantilevering out over the hill, preserving the garden below and minimizing the need to expand upon the house’s existing foundation. The renovation/addition adds 700 square-feet and a second level to the 1,100 square-foot house, and the new series of windows and decks assists in the house’s passive cooling strategy, providing shade to the first floor and ventilation throughout. The interior vaulted ceiling, as well as all of the wood used throughout the project, is made of recycled lumber or sustainably harvested materials. The bathrooms use recycled materials, including recycled sculptural Thassos marble cut into 4” x 8” tiles to add additional color and texture to the walls. Externally, drought tolerant plants were used in the new landscaping and a small outdoor fountain fed by captured rainwater helps to cool the patio. The boldness of the forms and the use of strong color really caught my eye. Lovely. I would be interested to see the 'before' pictures. 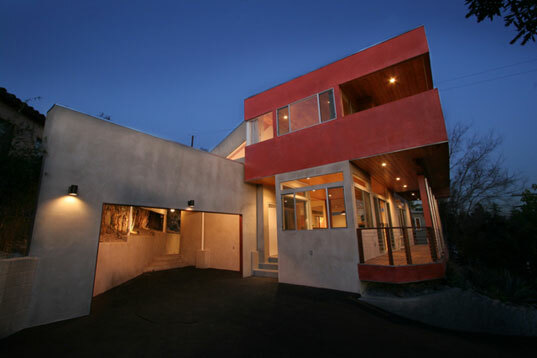 This sustainably built home addition, lovingly called the Red Box, gives its residents new, sweeping views of Los Angeles including a direct line of sight to the famous Griffith Observatory. Designed by Jeremy Levine, the project utilizes passive and active sustainable features throughout, while flooding the interior spaces with an ample dose of daylight and cutting back on overall electricity consumption. In addition, the mobile sunscreens on the box's façade control the amount of light and heat gain within the house while allowing for extra privacy as needed.